Humber Street Easter Bunny Trail! Hop on down to Humber Street this Easter school holidays and for a free family activity, our Easter Bunny Trail. Spend some quality time with your small people this Easter and hunt for our very special Easter bunnies! You’ll find them hidden inside many of the wonderful shops, restaurants and galleries in Humber Street, the Fruit Market area of Hull next to the marina. Enter and be in with chance to win an Easter Hamper. Each bunny is as unique as the place you’ll find it in – decorated by each independent business. Some of our bunnies may also have some exciting Easter treasures to collect along the way! 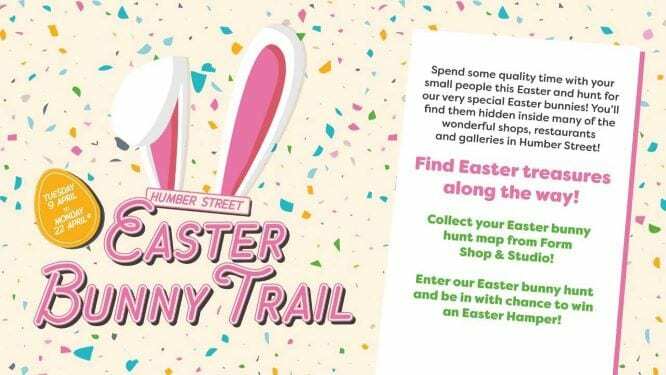 Collect your Easter bunny hunt map from FORM and don’t forget to hand it back in as everyone who takes part will be entered into a PRIZE DRAW to win an Easter Hamper including a luxury Easter egg from THE STORE ON PIER STREET. You can also collect your Easter bunny hunt map from Humber Street Gallery.